Looking for some excellent free games to start your October off right? 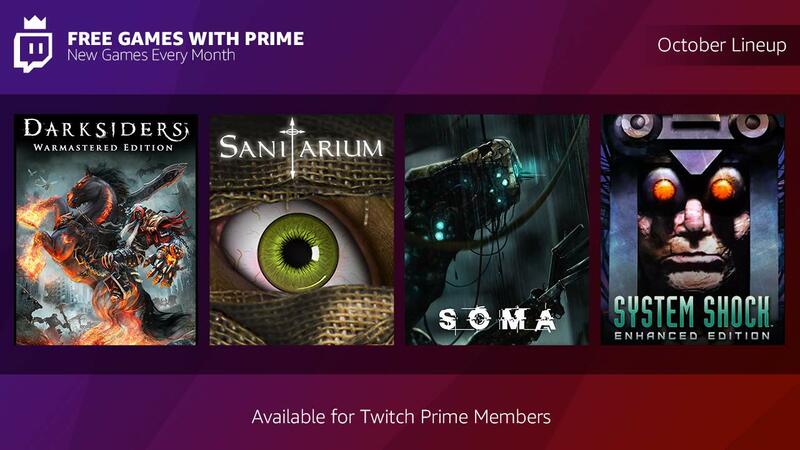 Twitch Prime subscribers have a whole bushel of awesome to look forward to starting today, with a spooky selection of games that are 100% free to add to your collection. This month's offerings include Darksiders Warmastered Edition, SOMA, Sanitarium, and System Shock. If you have an Amazon Prime membership, you have your Twitch Prime benefits that let you download and keep these games forever. Darksiders Warmastered Edition is the remastered version of the hack and slash puzzler Darksiders as you take on the role of War, one of the four horsemen of the Apocalypse. Meanwhile, SOMA is from the creators of Amnesia: The Dark Descent. You'll travel below the Atlantic Ocean into the underwater facility of PATHOS-II for some seriously creepy surprises. Now, the cream of the crop: Sanitarium and System Shock! Sanitarium is a classic PC adventure game the takes place after your character wakes up and finds himself in an old, spooky asylum with amnesia. It's truly disturbing in all the best ways. Finally, if you've never played the original System Shock, you're in for a treat with the Enhanced Edition here. It finds you waking up from a coma on a space station that's clearly in dire need of help – I won't spoil it further for those of you who have never played it. All four games are up for grabs now, which should give you a nice, appropriately creepy start to the season. Get ready to be spooked!